My father in law kindly looked after our dog at short notice so we could have an impromptu holiday… that deserves a wee present, right? 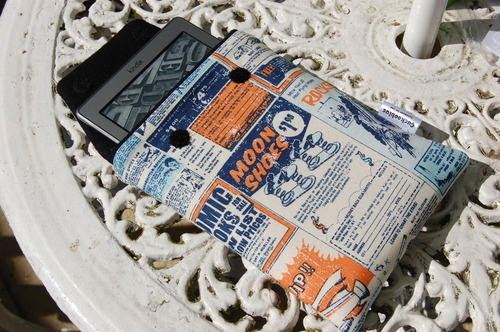 He had actually asked me to make him a Kindle case – apparently he felt his leather bound book-style case was too bulky, and he preferred to read the kindle as it was. Just exactly what I felt before making my own (and then several since as is always the way!). He also liked the idea that my cases are waterproof in case of spillages – coffee, waterbottles, water splashed on the poolside in that fantasy bahama life we all wish we led. Water proofing felt important to me too – we must be a clumsy family, though clearly not through genetics.. I adore this fabric. My father-in-law has a definite sense of fun and I thought this fabric managed to stay on the right side of fun without being too childish, and masculine without being too sombre. I could have chosen Harris Tweed, or a black or grey damask – or all manner of lovely masculine fabrics, but somehow they are just not quite HIM. Yes, sure, for luggage or something, but he’s definitely a slightly quirky accessoriser. 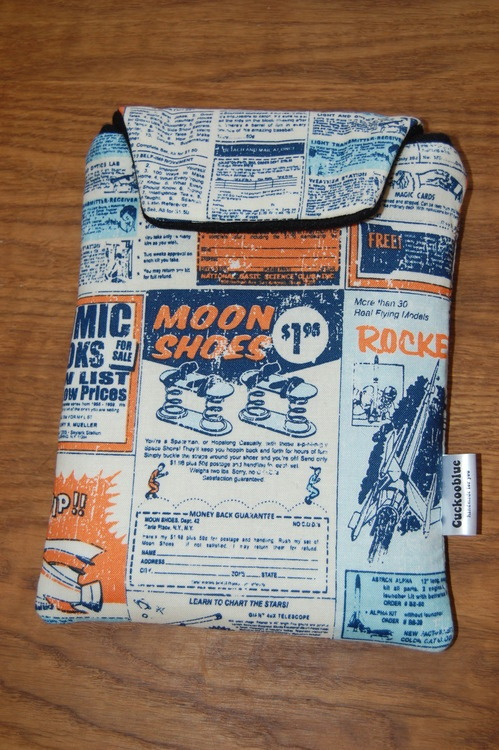 The fabric is called Rocket Ads in navy colourway (it also comes in navy and red) and is by October Afternoon for Riley Blake fabrics. It’s so deliciously retro. 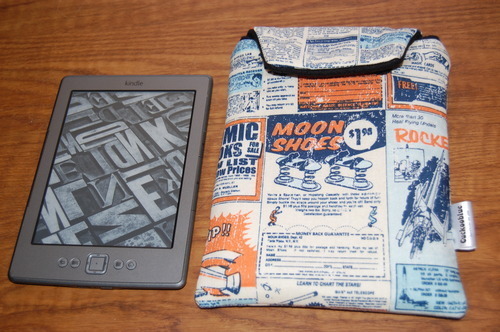 The case looks bigger than the kindle itself – it is bigger, but because I use a felted wool as lining fabric (like coat fabric) which is pretty thick, it’s a nice cosy fit in there. 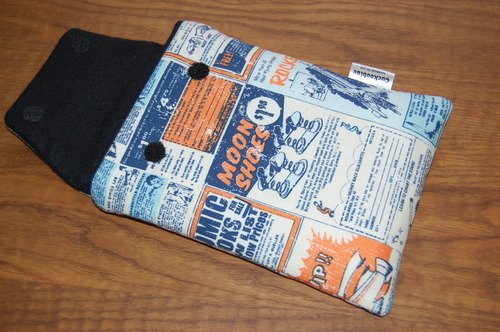 It is padded too for extra scratch-resistance and has a waterproof interlining so needs to be a bit bigger on the outside. It’s still actually a slender handsized thing, because the kindle is actually quite wee. But my own case is actually smaller, slimmer, neater, a little more made-to-measure – I used interfaced soft dress fabric as the lining and it’s just fine. I’m thinking I might return to that… I see some experiementing in my future. Meanwhile, more importantly my father in law loved it – he says he’s been reading all the wee adverts all over it. Er… I think he’s supposed to be reading the kindle…? One challenge done. 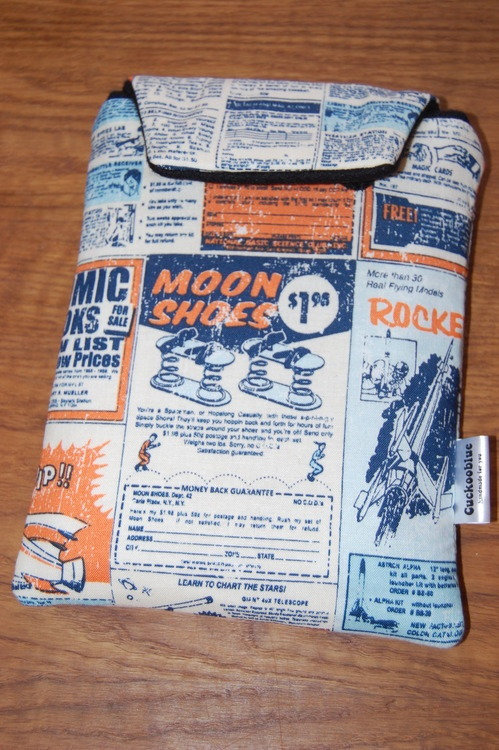 Except now he’s asked me to make a Kobo case for his girlfriend “my choice of fabric” as a surprise for her. Yikes. Ok. Um, but what’s a Kobo again…? Might be in trouble with this one!